Press Releases | Boker's, Inc.
Minneapolis, MN – March 13, 2019 – The performance demands of the outdoor recreational gear industry requires parts and components that combine light weight, extreme durability, high strength, corrosion- and UV-resistance, and offer the highest levels of reliability. Boker’s, Inc. delivers 100 years of application-solving experience for OEM challenges, including the industry-leading range of non-standard washer and spacer sizes, thickness, profiles and materials, plus custom, made-to-order washers, spacers, shims, stamped parts and components, manufactured for hundreds of products in the outdoor, adventure sports and recreational industries. OEMs recognize the unique qualifications, capabilities and industry-leading quality offered by Boker’s, including over 32,000 non-standard washers sizes that can be manufactured to exact specifications with no tooling charges. Custom washers are available in outside diameters ranging from .080 inches to 12 inches. Boker’s custom stamping offering includes flat blanking and piercings in sizes up to 12" x 12", complex metal forming in thicknesses from .005" to .190" (varies by material), and deep draws up to 3" and 8" in diameter. Boker’s, Inc. offers immediate access and experience with over 2,000 common and hard-to-find exotic material choices to meet the needs of the outdoor recreational market, including metallic or non-metallic options, low-carbon sheet steel, numerous super alloys, stainless steel, aluminum, brass, beryllium copper, phosphor bronze and nickel silver. Non-metallic materials available include ABS, acetal, polyester, nylon, MD nylon, polycarbonate, fiber, polyethylene and NEMA-grade laminates. Boker’s is also equipped with in-house secondary operations to meet the demanding finishing requirements of the industry including deburring, tapping, reaming, counterboring, and spotfacing, plus trusted local vendors for heat treating, plating and non-destructive testing (N.D.I.). Boker’s also offers 3D rapid prototyping and functional prototyping, plus co-development capabilities to help OEMs efficiently solve their product engineering challenges quickly. With unmatched experience and expertise, leading size and material selection, high-capacity production and quick order turnaround, Boker’s delivers quality-certified, customized solutions, fast and economically in short, medium and long runs. Use Boker’s easy on-line specification engine to find your tooling size, thickness and material requirements for millions of configurations. To quote your custom stamping project, complete Boker’s fast quote form and upload your CAD files or production prints. When it comes to products destined for the great outdoors, Boker’s goes the distance. Boker’s, Inc., is a woman-owned, AS9100 and ISO 9001 certified manufacturer of precision stampings and non-standard washers and spacers. To request a complimentary copy of Boker’s 2019 Stampings & Washers Catalog or sample pack, contact: Boker’s, Inc., 3104 Snelling Avenue, Minneapolis, MN 55406-1937; call 612-729-9365 or (TOLL-FREE) 800-927-4377 or visit bokers.com. 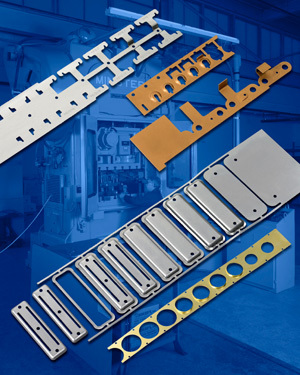 Boker’s has the expertise and capacity to provide quality, custom precision metal stampings. Flat blanking and piercings are available in a complete range of sizes up to 12 inches by 12 inches, metal forming in thicknesses from .005 inches to .190 inches (varies by material) and draws up to 3 inches deep and 8 inches in diameter. Boker’s also provides all the secondary operations you would expect from your stamping manufacturer including deburring, tapping, reaming, counterboring, and spotfacing. “We excel with tight tolerances for all aforementioned considerations as well as our ability to manufacture parts as “burr free” as possible within our burr standards which is based on material thickness,” said Kersey. 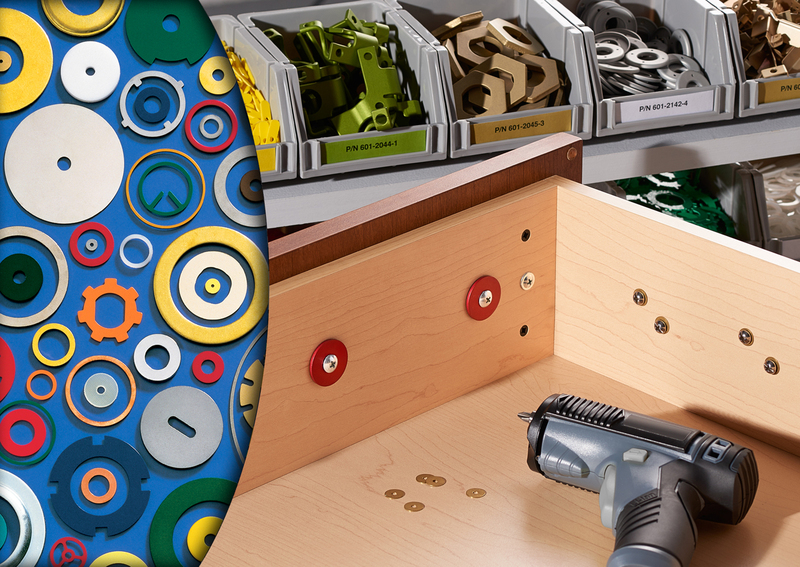 Washers, spacers, and shims are used in almost every application imaginable. When it comes to the cutlery industry some examples are in the manufacturing of folding knives and multi-tools. For both folding knives and multi-tools, washers, spacers, and shims are most widely used to reduce friction and wear between moving parts. Boker’s has over 32,000 thousand stock tools for immediate availability to manufacture non-standard flat washers, spacers, and shims from over 2,000 commonly used and hard to find materials. Materials include low-carbon steel sheet, various spring steels, stainless steel, aluminum, brass, copper, phosphor bronze, and nickel silver. Non-metallic materials include ABS, acetal, polyester, nylon, MD nylon, polycarbonate, fiber, polyethylene, various NEMA grade phenolics, and many more. For more information on Boker’s, please visit bokers.com. 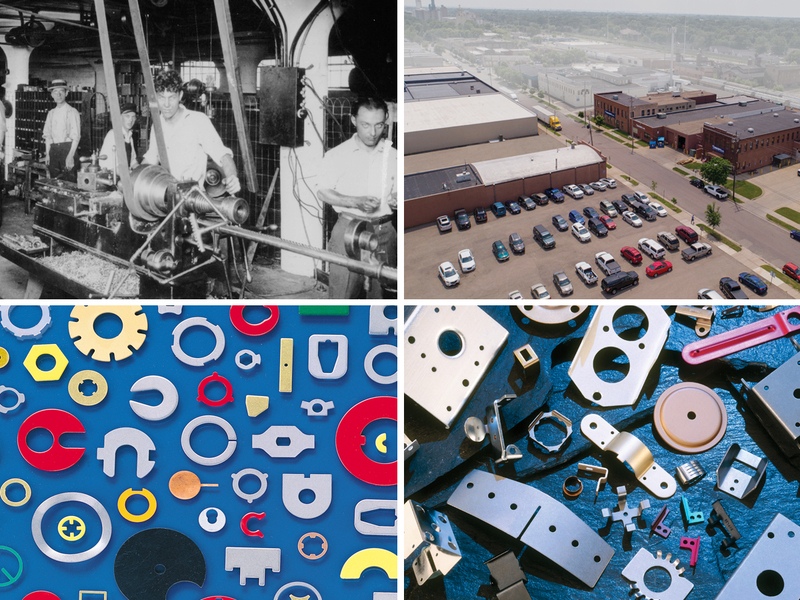 Minneapolis, MN – January 16, 2019 – Boker’s, a metal stamping manufacturer of precision metal stampings, washers, spacers and shims, reaches its 100th anniversary in 2019. Boker’s will celebrate and honor its valued customers and employees throughout the year and also the opening of their new manufacturing facility. Boker’s, founded in 1919 by Vitus Boker and his son, John, started their family business around their first products, an envelope folding machine and a small hand check protector. However, with his tooling knowledge, the enterprise began generating more revenue from manufacturing prototypes and custom parts for automated machinery. As the word spread of Boker's unique process for producing high-quality, short-run, stamped metal parts, demand grew. Vitus quickly found himself entrenched within the stamping industry as one of the pioneers of short-run stampings. The business boomed and has continued to flourish throughout the years, growing in space and customer base. In 1968, Boker’s was purchased by four of its employees: William (Bill) Tedlund, Joseph Basara, Chester Engquist, and Joseph Kantorowicz, and was run successfully for many years. In 1986 Bill Tedlund became the sole owner. He continued to lead the business with the Boker’s values and traditions, instilling those principles with his own family. Today, Boker’s is still a privately held family-owned business, guided by Vitus Boker’s principals of hard work and attention to detail with Bill Tedlund as Chairman of the Board. From starting to help out the family business as children, the legacy continues with Bill’s children Wendy, Amy and Barry as shareholders. Amy Kersey (Bill’s daughter) is the current CEO/President and her sons, Chuck and Tony Kersey as the 5th generation at the helm of Sales and Marketing. Minneapolis, MN—December 4, 2018—Garmers Dental Instruments, Inc. has been in business for over a century. Starting out as a small dental practice in Minneapolis, Minnesota, it later grew into a successful dental instrument manufacturer. Herman Garmers was a practicing dentist who came up with an idea to improve the clamping structure for dental cotton roll holders. His vision was to create a holder that would securely hold the cotton rolls in the desired absorbent position. This instrument was patented on January 20th, 1953. Cotton holders are used in various applications such as bleaching, cavities, fillings and operative and restorative treatments. The holders provide more retraction, accessibility and visibility of the working area during a procedure. These are most important for use when a dentist is working alone without an extra pair of hands to help isolate the area being worked on. During the journey of developing his improved cotton roll holder, Garmers discovered he needed complex stamping pieces manufactured to secure the connecting parts of the instrument. This is where an accidental meeting provided Garmers with the partner he needed to produce the holder. 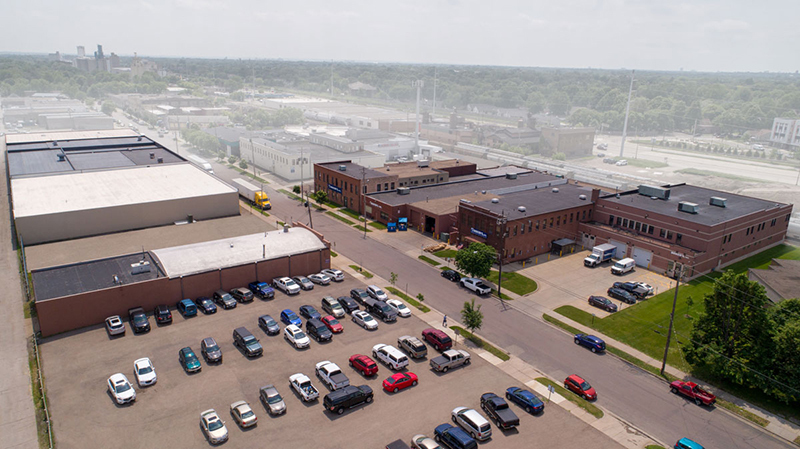 A minor fender bender between Garmers and J.P. Boker, who happened to operate a stamping and washer manufacturing company in Minneapolis, turned into an immediate business relationship. At the time, Garmers could not find a supplier who was able to manufacture the stamped parts needed to complete his dental instrument in large quantities. Boker's was known in the industry for being able to make custom, complex stampings to match any customer's specification. The Garmers' cotton roll holder is a "household name" in the dental industry. 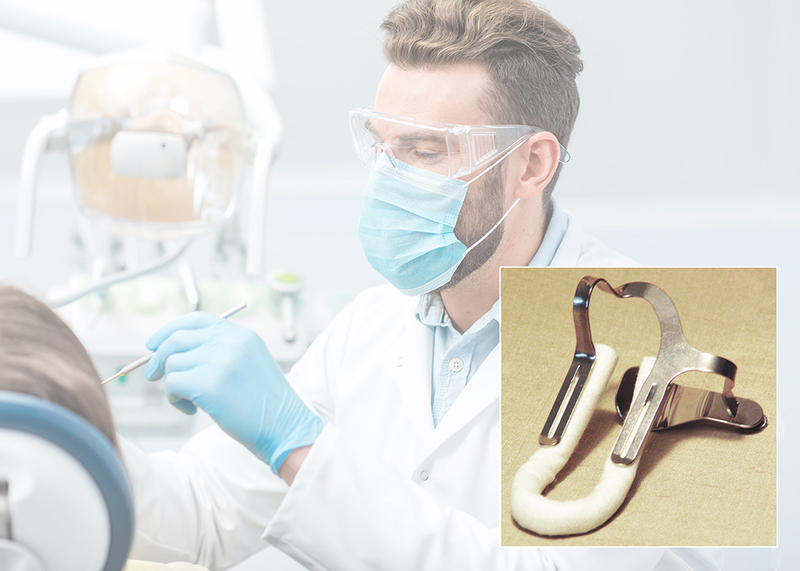 The cotton roll holder securely holds any size or length of cotton in place during dental procedures. This keeps the cotton from rolling away or popping out. 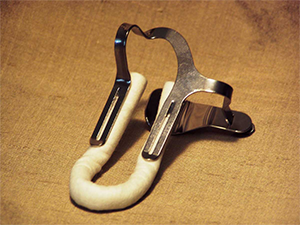 Another unique feature is the sliding chin clamp that keeps the holder in place on every patient, child or adult. "This chance meeting ended up being a perfect match for both of us and we have continued a strong business relationship that is now going on 85 years," said Chuck Kersey, Assistant Sales Manager at Boker's. "Both Garmers and Boker's share the same principals of hard work, attention to detail, and moral and ethical behavior in everything that they do." Boker's, Inc., continues to specialize in producing high quality custom metal stampings for dental and medical applications. This precision manufacturing covers a complete range of sizes up to 12 inches x 12 inches (flat) with thicknesses from .005 inches to .190 inches (varies by material) and draws of up to 3 inches deep and 8 inches in diameter. Boker's utilizes many of the latest technologies and precision metal stamping manufacturing concepts to focus on providing customers with quality stampings that fit their needs. With over 2,000 stock material options including metallic and non-metallic, Boker's can produce custom stampings, washers, spacers and shims in short, medium or long runs. In addition, Boker's provides a dedicated quality-assurance department to ensure products meet strict customer requirements. Boker's, Inc., is a woman-owned, AS9100 and ISO 9001 certified manufacturer of precision stampings and non-standard washers and spacers. To request a complimentary copy of Boker's 2019 Washers Catalog, Stamping Brochure or sample pack, contact: Boker's, Inc., 3104 Snelling Avenue, Minneapolis, MN 55406-1937; call 612-729-9365 or (TOLL-FREE) 800-927-4377 or visit bokers.com. Minneapolis, MN—November 14, 2018—Boker's, Inc., a manufacturer of precision metal stampings, washers, spacers and shims for over one hundred years, announces the availability of the new 2019 Stampings and Washers Catalog. This year's commemorative catalog is a combination of their stampings and washers capabilities, including a special section celebrating their 100th anniversary, featuring an overview of Boker's rich history, significant milestones and memories from employees throughout the years. 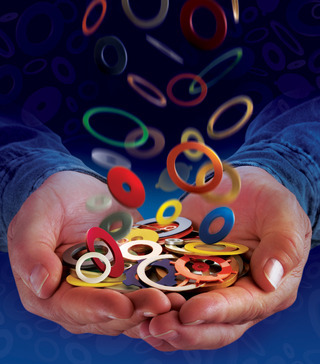 This 72-page catalog offers a reference guide for over 32,000 stock tools for flat washers, spacers and shims, including 500 new washer sizes, allowing customers to choose from a wide variety of sizes, thickness and materials. With outside diameters of 0.080" to 5.140" and a wide variety of inside diameters available. Boker's also manufactures special shapes and sizes up to 12" in diameter, as well as a large range of inside diameters and thicknesses. The catalog also includes the latest stamping technologies and manufacturing concepts to satisfy standard to complex and intricate stamping application needs. Boker's covers a complete range of sizes up to 12" x 12" (flat) with thicknesses from .005" to .190" (varies by material) and draws up to 3" deep and 8" in diameter. Boker's expanded facility and operations provides immediate access to 2,000 commonly specified and hard-to-find materials as well as secondary machining operations including deburring, tapping, reaming, counterboring, spotfacing and more. "The new catalog was designed as a reference tool to demonstrate all of the custom manufacturing capabilities we have to offer," said Chuck Kersey, Assistant Sales Manager. "It also tells the story of the dedicated employees we are fortunate to have who make Boker's a successful and long-standing partner." For more information on Boker's or to request a calendar, please visit bokers.com. Boker's, Inc., is a woman-owned, AS9100 and ISO 9001 certified manufacturer of precision stampings and non-standard washers and spacers. 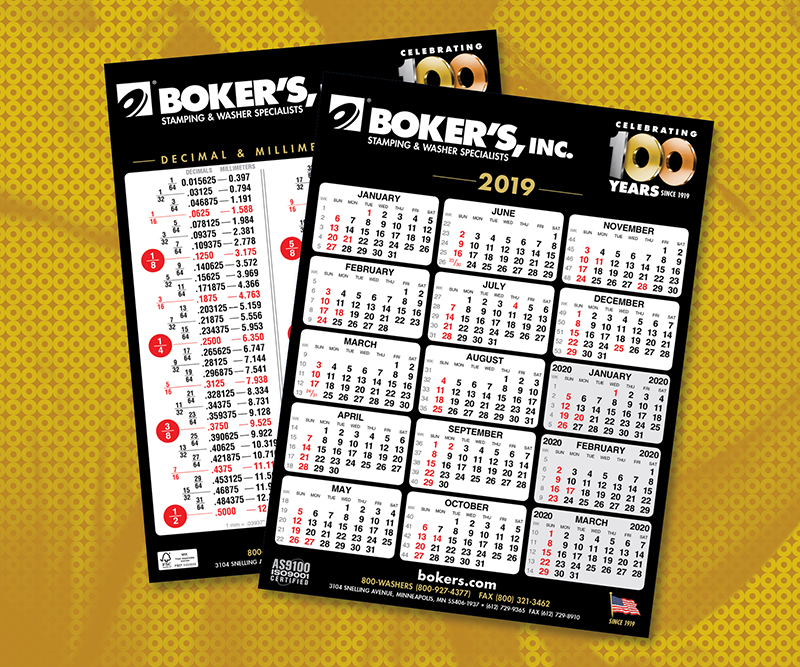 To request a complimentary copy of Boker's 2019 100th Anniversary Catalog, contact: Boker's, Inc., 3104 Snelling Avenue, Minneapolis, MN 55406-1937; call 612-729-9365 or (TOLL-FREE) 800-927-4377 or visit bokers.com. 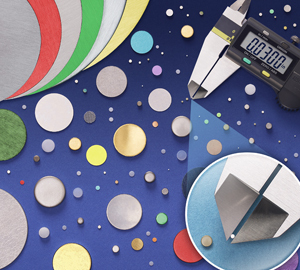 Minneapolis, MN—October 29, 2018—Boker's, Inc., manufacturing precision metal stampings, washers, spacers and shims for over one hundred years, announces the availability of its 2019 scheduling calendar. This easy-to-navigate 15-month complimentary calendar provides a comprehensive at-a-glance view of the 65-week scheduling guide, including boldly identified Sundays and holidays in red. Boker's is committed to offering convenient tools for industry professionals' diverse needs, based on a century of stamping industry experience. In addition to easy date-finding, the dual-sided calendar offers a handy metric conversion chart that provides decimal and millimeter equivalents for common measurements ranging from 1/64 to 1 inch and .1 to 100 mm. Boker's dual-sided calendar and conversion chart also helps users choose from the company's inventory of more than 32,000 non-standard flat washer stock tool sizes with outside diameters of 0.080" to 5.140" and a wide variety of inside diameters. Customers can choose from a wide variety of sizes, thicknesses and materials, including non-metallic. Boker's also satisfies complex, precision stamping applications up to 12" in diameter and material thickness from .005" to .190" (varies by material). With over 2,000 stock material options, Boker's can produce custom stamping, washer, spacer and shim requirements in short, medium or long runs. In addition, Boker's provides a dedicated quality-assurance department to ensure products meet strict customer criteria, coupled with fast delivery to make sure that parts are delivered on time. Boker's, Inc., is a woman-owned, AS9100/ISO 9001 certified manufacturer of precision stampings and non-standard washers and spacers. To request a complimentary copy of Boker's 2018 Washers Catalog, Stamping Brochure or sample pack, contact: Boker's, Inc., 3104 Snelling Avenue, Minneapolis, MN 55406-1937; call 612-729-9365 or (TOLL-FREE) 800-927-4377 or visit bokers.com. Minneapolis, MN—September 25, 2018—Boker's, Inc. has added 512 new flat washer sizes to its extensive offering. These additions expand its production capacity for a wide range of applications and industries. With the addition of new sizes, Boker's offers an expansive line of over 32,000 non-standard washer, spacer and shim sizes with no tooling charge. "Boker's specializes in manufacturing non-standard flat washers, spacers and shims made to the customer's exact specifications," said Tony Kersey, Boker's Communications Director." With the addition of new sizes, we can offer a vast number of custom-built solutions." Boker's non-standard precision washers are manufactured in over 2,000 commonly specified and difficult to find material options. The company also provides a comprehensive range of sizes, including outside diameters from 0.080 inches to 12.00 inches with a wide range of inside diameters as well. Offering flexible production quantities, Boker's can accommodate short-, medium- and long-runs with fast delivery turnarounds. 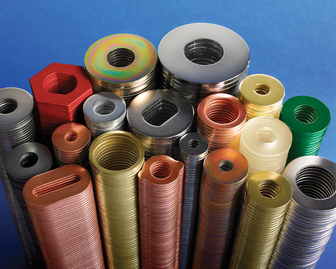 In addition to flat washers, other shapes and styles are available in metallic and non-metallic materials. Metallic materials include low-carbon steel sheet, various spring steels, stainless steel, aluminum, brass, copper and nickel silver. Non-metallic materials include ABS, acetal, polyester, nylon, MD nylon, polycarbonate, fiber, polyethylene and various NEMA grade phenolics. 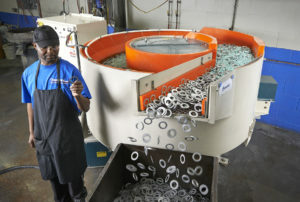 To learn more about Boker's washers, visit bokers.com. Minneapolis, MN—July 10, 2018—Boker's, a metal stamping manufacturer of precision metal stampings, washers, spacers and shims, announces the expansion of their manufacturing facilities in response to their growing customer needs. The expansion project began in March 2018 and is projected to be completed by December 2018. Boker's manufacturing facilities are currently housed in nearly 100,000 square feet of buildings. 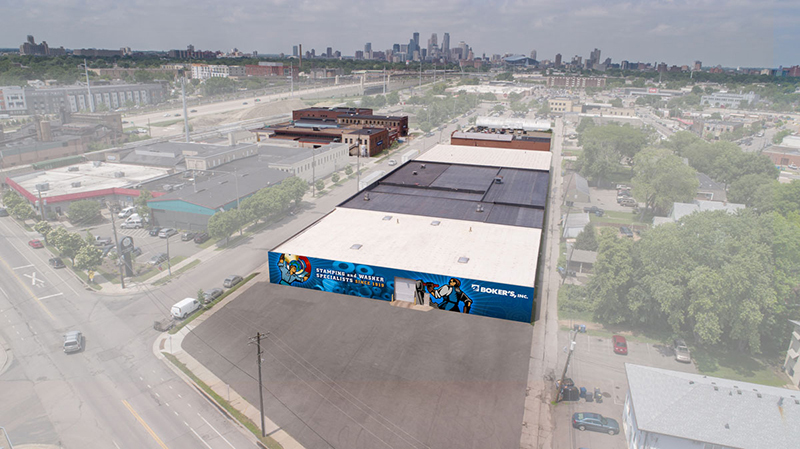 The newly acquired building, adjacent to their current facility, will add an additional 66,500 square feet of manufacturing space. "We have a diverse customer base with a presence in most every industry," said Mark Kersey, Vice President at Boker's. "With both industries and customers evolving, we continue to adapt to meet their needs and service them. We will be able to streamline our workflow process and add more capacity with the new space as product diversification continues to grow." "Since 1919, Boker's has expanded their manufacturing space every 8 years," said Kersey. "This new expansion nearly doubles our manufacturing space allowing us to design the shop floor for the future by adding new capabilities as our customers' needs continue to evolve." "The renovation has been going seamlessly, and we will continue to deliver timely quality products and services to our customers throughout the process," said Tony Kersey, Communications Director. Boker's has over 32,000 stock tools for immediate availability to manufacture non-standard flat washers, spacers and shims from over 2,000 commonly used and hard to find materials. In addition, Boker's has the expertise and capacity to provide quality, custom precision metal stampings. For more information on Boker's, please visit bokers.com. Minneapolis, MN—April 2nd, 2018—Boker's, a metal stamping manufacturer of precision metal stampings, washers, spacers and shims, expands its capabilities for stampings and washers in recreational vehicle applications. "The recreational vehicle industry is rapidly growing and constantly adapting to riders' specific needs and changing terrains," said Tony Kersey, Communications Director. "As design engineers evolve and develop new products and concepts for recreational vehicles, the process will often require custom metal stampings." 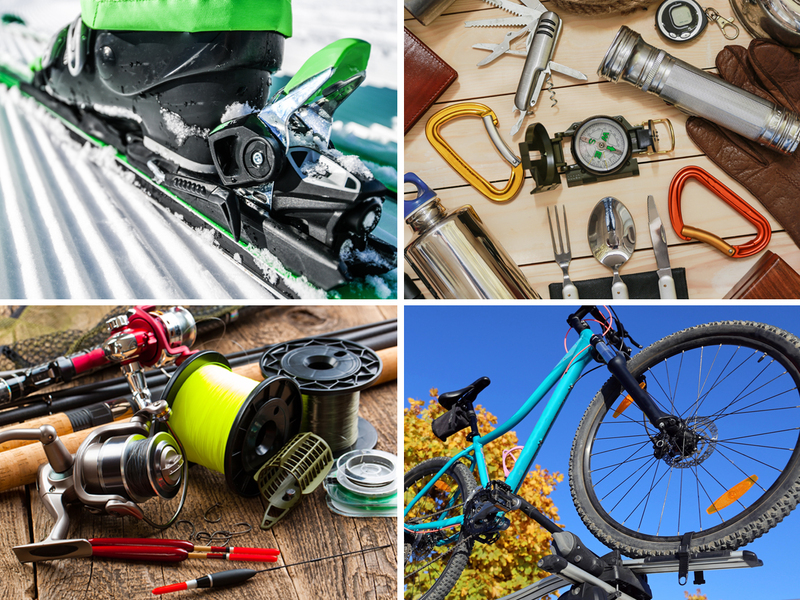 Boker's stampings, washers, spacers and shims can be used in a variety of recreational vehicle applications such as watercrafts, motorhomes, motor bikes, side by sides and ATVs. 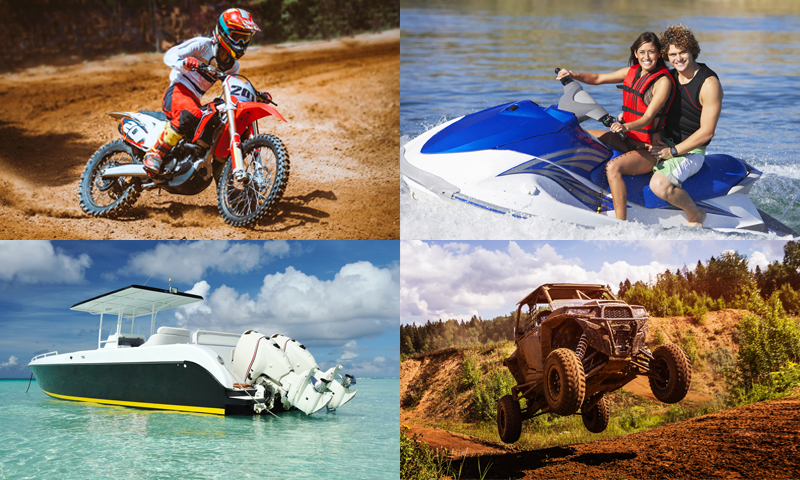 Boker's products are commonly used in various applications throughout the build of recreational vehicles: transmissions, drivetrain and seat assemblies, floats, enclosures, brackets, vibration dampening and suspension systems, just to name a few. Boker's has over 32,000 stock tools for immediate availability to manufacture non-standard flat washers, spacers and shims from over 2,000 commonly used and hard to find materials. In addition, Boker's has the expertise and capacity to provide quality, custom precision metal stampings. Flat blanking and piercings are available in a complete range of sizes up to 12 inches by 12 inches, metal forming in thicknesses from .005" to .190" (varies by material) and draws up to 3 inches deep and 8 inches in diameter. For more information on Boker's stampings and washers for recreational vehicle applications, please visit, bokers.com. Boker's, Inc., is a woman-owned, AS9100/ISO 9001 certified manufacturer of precision stampings and non-standard washers and spacers. To request a complimentary copy of Boker's 2018 Washers Catalog, contact: Boker's, Inc., 3104 Snelling Avenue, Minneapolis, MN 55406-1937; call 612-729-9365 or (TOLL-FREE) 800-927-4377 or visit bokers.com. Minneapolis, MN—March 1, 2018—Boker's, a manufacturer of precision metal stampings, washers, spacers and shims, is the leading stamping manufacturer of application specific D-washers. D-washers get their name based on the "D" shape that is created by having a flat edge on either the OD, the ID or a combination of both. D-washers provide a flat bearing surface and are used under the head of a bolt and / or a nut to disperse loads as well as prevent the washer from turning in the application. They are generally mounted with the flat edge of the washer facing a flat surface or recessed hole. Many applications require D-washers and they are used in many industries such as automotive, marine, aerospace, medical and countless more. "D-washers, also referred to as clipped washers, are generally used in applications where space limitations do not allow the use of a flat round washer, as well as when keeping an assembly stationary is required," said Chuck Kersey, Assistant Sales Manager. Boker's maintains over 32,000 stock tools for flat round washers, spacers and shims without tool charges. You can choose from a wide variety of sizes, thicknesses and materials, including non-metallic to suit your application. With outside diameters of 0.080" to 5.140" and a wide variety of inside diameters, you have millions of flat and specialty washer possibilities. Boker's D-washers are custom produced in short, medium and long runs with fast delivery, minimal tool cost and 3D prototypes available. For your application specific quote please submit your specifications by using our fast quote form. To learn more about Boker's D-washers, visit bokers.com. Minneapolis, MN—February 1, 2018—Boker's, a manufacturer of precision metal stampings, washers, spacers and shims, offers a wide variety of custom C-washers to its customers. C-washers obtain their name for being in the shape of a "C" as they have a slot cut from the center to the perimeter allowing the washer to be removed, replaced or inserted without completely removing the fasteners. C-washers are designed to slide in and out of position on a bolt or shaft in a partially completed assembly. 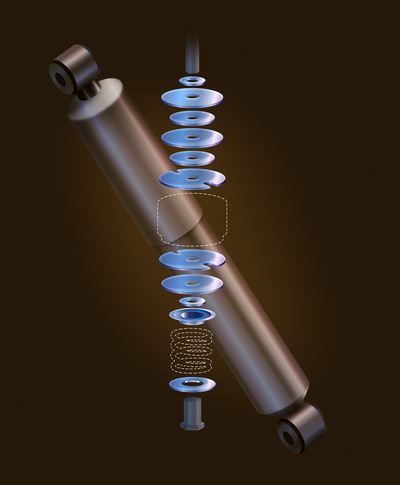 They can also be used as a retention device on a grooved shaft to keep components in place. C-washers can be quickly inserted, repositioned or removed without having to disconnect the fastener, which increases productivity. "Boker's C-washers are customizable and manufactured to the exact specifications needed," said Pete Flodquist, Sales Manager at Boker's. "With almost a century of experience, Boker's has developed the most efficient and effective methods for producing complex custom products from progressive dies or single-stage tooling." C-washers can be produced in over 2,000 commonly specified and difficult to find materials including low-carbon steel sheet, various spring steels, stainless steel, aluminum, brass, copper and nickel silver. Non-metallic materials include ABS, acetal, polyester, nylon, MD nylon, polycarbonate, fiber, polyethylene and various NEMA grade phenolics. Boker's C-washers are custom produced in short, medium, and long runs with fast delivery, minimal tool cost and 3D prototypes available. To learn more about Boker's C-washers, visit bokers.com. Minneapolis, MN—September 28, 2017—Boker's, Inc. has added 700 new flat washer sizes to its extensive offering. These additions expand its production capacity for a wide range of applications and industries. With the addition of new sizes, Boker's now offers an expansive line of over 32,000 non-standard washer and spacer sizes with no tooling charge. "Boker's prides itself on providing the ultimate customization capabilities to our customers," said Nick Todora, Boker's Communications Director. "With the addition of new sizes, we can offer a variety of custom-built solutions, including numerous metallic and non-metallic materials, sizes, thicknesses and production quantities." Boker's non-standard precision washers are manufactured in over 2,000 commonly specified and difficult to find material options. The company also provides a comprehensive range of sizes, including outside diameters from 0.030 inches to 12.00 inches with a wide range of inside diameters as well. Offering flexible production quantities, Boker's can accommodate short, medium and long runs with fast delivery turnarounds. In addition to flat washers, other various shapes and styles are available in metallic and non-metallic materials. Metallic washers include low-carbon steel sheet, various spring steels, stainless steel, aluminum, brass, copper and nickel silver. Non-metallic materials include ABS, acetal, polyester, nylon, MD nylon, polycarbonate, fiber, polyethylene and various NEMA grade phenolics. Boker's, Inc., is a woman-owned, AS9100/ISO 9001 certified manufacturer of precision stampings, washers, spacers and shims. To request a complimentary Sample Pack and Total Service Brochure, contact: Boker's, Inc., 3104 Snelling Avenue, Minneapolis, MN 55406-1937; call 612-729-9365 or (TOLL-FREE) 800-927-4377, or visit Bokers.com. Minneapolis, MN—July 25, 2017—Boker's, a metal stamping manufacturer of precision metal stampings, washers, spacers and shims, expands capabilities for dome washer applications. To expedite your dome washer order and shorten delivery time, Boker's has immediate access to over 2,000 commonly specified and hard to find materials including low carbon, cold rolled strip and sheet steel, SAE 1050, 1075 and 1095 spring steel, low alloy steel sheets, brass, copper, nickel silver, beryllium copper, stainless steel and aluminum. Dome washers can be heat treated and plated to meet your exact specifications. Boker's can manufacture custom stampings, washers, spacers and shims with an outside diameter from 0.080 inches to 12 inches and material thickness from .005" to .190" inches. Boker's is committed to delivering quality, precise custom dome washers for just about any application need. To learn more about Boker's dome washers and stampings, visit Bokers.com. Minneapolis, MN—April 5, 2017—Boker's now offers additive manufacturing to provide customers with three-dimensional prototypes. Using a Stratasys 3D printer, Boker's creates quick prototyping of custom designs for 3D washer and stamping models. "Once a customer's CAD file has been received, we can provide a 3D printed prototype, to help shorten the development cycle," Mark Kersey, VP, Boker's, Inc. "By quickly moving from concept through design and into production, our customers can test parts for accurate form, fit and function prior to producing the actual stamped part." Boker's provides prototypes for a variety of new custom stampings, complex stampings or larger orders to ensure the final stamped part is exactly as expected. Customers review and test prototypes to verify parts are up to specification and make any necessary CAD file adjustments prior to production, avoiding unexpected surprises. Boker's can produce prototype parts up to 12 x 10 x 10 inches with a minimum thickness of 0.03 inch. 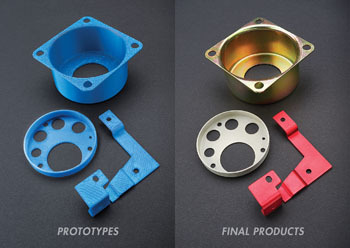 Prototypes are made from an ABS material and come in a variety of color options. Most 3D prototypes are shipped within 48 hours of receipt of approved CAD files. When it comes to producing the final stamping or washer, Boker's offers limitless customization options. 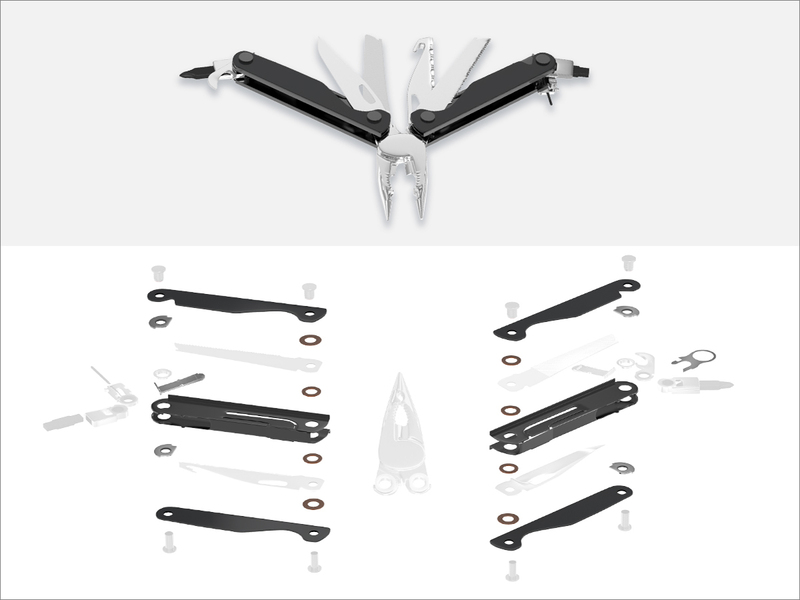 With over 2,000 commonly specified and difficult-to-find material options, including low-carbon steel, spring steel, stainless steel, aluminum, brass, copper and nickel silver, in addition to non-metallic options such as ABS, Nylon, PTFE, Acetal, and NEMA grade laminates, Boker's is able to quickly turn quality products for many different customer needs. Finishing services available include chrome, nickel and zinc plating, anodizing, polishing, and more. To request a prototype part for a project or to learn more about Boker's precision washers and stampings, visit Bokers.com. Boker's, Inc. is a woman-owned, AS9100/ISO 9001 certified manufacturer of precision stampings, washers, spacers and shims. To request a complimentary Sample Pack and Total Service Brochure, contact: Boker's, Inc., 3104 Snelling Avenue, Minneapolis, MN 55406-1937; call 612-729-9365 or (TOLL-FREE) 800-927-4377 or visit Bokers.com. Minneapolis, MN—August 2, 2016—Boker's is pleased to announce its extensive manufacturing capabilities for metallic and non-metallic disks for spacing and specialized assembly applications. 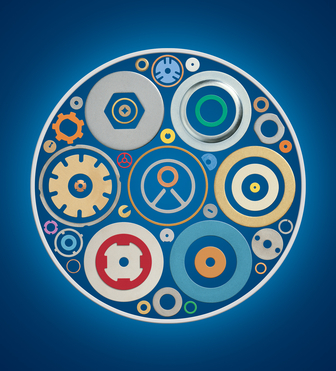 Most commonly known as discs, circles, plates and/or slugs, disks are designed like a flat washer, generally without the center hole, and provide precise space between components or materials in addition to load disbursement. Boker's disks come in a wide range of sizes, including outside diameters ranging from 0.030 inches to 12 inches, and with material thicknesses ranging from .005" to .190" inches to accommodate the widest variety of application requirements. Boker's disks are available in more than 2,000 commonly specified and difficult-to-find materials, including low-carbon sheet steel, various spring steels, stainless steel, aluminum, brass, copper and nickel silver. Non-metallic material options include ABS, acetal, polyester, nylon, nylon MD, polycarbonate, fiber, polyethylene and various NEMA grade laminates. Additionally, all of Boker's 30,000 washer sizes are available without the I.D. hole with no additional tool charge. “With thousands of material options, Boker's 30,000 stock washer tools are available without the center hole. Boker's can provide the exact disk for any application” – Nick Todora, Marketing Manager at Boker's. Boker's industry knowledge and customer service dedication is world class, including “Just-In-Time” (J.I.T.) and “Dock-to-Stock” programs which are available, and were created to ensure that their customers' flexible delivery and stocking requirements are always met. For more information on Boker's disks, please visit Bokers.com. Boker's, Inc. is a woman-owned, AS9100/ISO 9001 certified manufacturer of precision stampings, washers, spacers and disks. To request a complimentary Sample Pack and Total Service Brochure, contact: Boker's, Inc., 3104 Snelling Avenue, Minneapolis, MN 55406-1937; call 612-729-9365 or (TOLL-FREE) 800-927-4377 or visit Bokers.com. Minneapolis, MN—May 9, 2016—Boker's has expanded its manufacturing capabilities to produce custom finishing washers, giving assembly applications a more precise, high-quality look and complete finish. Finishing washers, also referred to as countersunk washers, provide a flush surface and are custom manufactured in several common styles including: 90 degree, angle, flanged, un-flanged and rolled flange. In addition to achieving a secure finished appearance and fit for fasteners, finishing washers offer additional functionalities, including: locking, sealing, insulating, load distribution, added strength and rigidity. This provides a safeguard for continuous performance. Finishing washers assure a lasting bond that can be easily unfastened for repair without damage to the substrate. When a proof of concept for a specific design is needed, Boker's has 3D printing model capabilities. For complete customization, Boker's offers a wide range of metallic materials such as low-carbon steel, spring steel, stainless steel, aluminum, brass, copper and nickel silver. Finishing services include chrome, nickel and zinc plating, anodizing, polishing, plus more. With a commitment to fast delivery and world-class customer service, Boker's “Just-In-Time” (J.I.T.) and “Dock-to-Stock” programs meet flexible delivery and stocking requirements. In case of an urgent requirement, orders can also be expedited for even faster delivery. Orders require a minimum production run of 100 pieces, which is optimal for prototype production and short run applications. For more information on Boker's finishing washers and stampings, please visit Bokers.com. Boker's, Inc. is a Woman Owned, AS9100/ISO 9001 certified manufacturer of precision stampings, washers, spacers and shims. To request a complimentary Sample Pack and Total Service Brochure, contact: Boker's, Inc., 3104 Snelling Avenue, Minneapolis, MN 55406-1937; call 612-729-9365 or (TOLL-FREE) 800-927-4377 or visit Bokers.com. Minneapolis, MN—February 9, 2016—With ongoing investments in manufacturing equipment, technology and process improvement, Boker's offering of made-to-order stampings and washers for medical applications continues to grow. From medical beds and furniture to I.V. 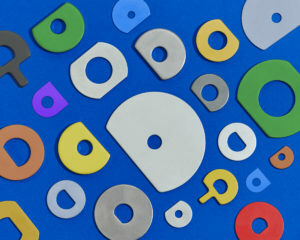 components and pacemakers, Boker's stampings and washers are ideal for a wide range of medical equipment and devices. To accommodate medical applications, Boker's stampings and washers are available in over 2,000 commonly specified and difficult-to-find material options, including medical standard stainless steel, titanium and non-metallic materials such as ABS, PTFE and PDVF. Boker's offers over 29,000 non-standard flat washer and spacer sizes without tooling charges. With a commitment to fast delivery and superior customer service, Boker's “Just-In-Time” (J.I.T.) and “Dock-to-Stock” programs meet flexible delivery and stocking requirements. In case of an urgent requirement, orders can also be expedited for even faster delivery. Orders require a minimum production run of 100 pieces, which is optimal for medical device prototype production and short run applications. For additional information, please visit: Bokers.com. Minneapolis, MN—December 8, 2015—Boker's Inc. valve shim stacks offer superior finishing capabilities to accommodate a wide range of recreational, automotive and industrial applications. Boker's precise, smooth finishing design ensures the shim stacks work together effectively and efficiently to dampen suspension movement. With over 95 years of experience-tested and made-to-order manufacturing capabilities, Boker's Inc. valve shim stacks are precisely manufactured to unique customer specifications with fast delivery turnarounds. Boker's valve shim stacks feature exact, consistent thicknesses, inside diameters and outside diameters. Shims can be custom manufactured with outside diameters from 0.080" to 12" and material thicknesses from .005" to .190" to satisfy virtually any shim stack application, ranging from simple to complex. To ensure reliable performance, shim stacks are heat treated to operate in temperatures exceeding 500 degrees without losing strength. Boker's shims are used to achieve precise spacing or to fill space between mismatched components, ensuring continuous operation. Boker's valve shim stacks are available in over 2,000 commonly specified and difficult-to-find material options. Metallic material options include low-carbon sheet steel, various spring steels, stainless steel, aluminum, brass, copper and nickel silver. Non-metallic options include ABS, acetal, polyester, nylon, MD nylon, polycarbonate, fiber, polyethylene and various NEMA grade laminates. Minneapolis, MN—August 18, 2015—Boker's, Inc. has added 745 new flat washer sizes to its extensive offering. These additions expand its production capacity for a wide range of applications and industries. With the addition of new sizes, Boker's now offers an expansive line of over 28,000 non-standard washer and spacer sizes. "Boker's prides itself on providing the ultimate customization capabilities to our customers," said Nick Todora, Communications Director, Boker's. "With the addition of new sizes, we can offer a variety of custom-built solutions, including numerous metallic and non-metallic materials, sizes, thicknesses and production quantities." Boker's non-standard precision washers are manufactured in over 2,000 commonly specified and difficult to find material options with no tooling charges. The company also provides a comprehensive range of sizes, including outside diameters from 0.080 inches to 12.00 inches with a wide range of inside diameters as well. Offering flexible production quantities, Boker's can accommodate short, medium and long runs with fast delivery turnarounds. In addition to flat washers, other various shapes and styles are available in metallic and non-metallic materials. Metallic washers include low-carbon steel sheet, various spring steels, stainless steel, aluminum, brass, copper and nickel silver. Non-metallic materials include ABS, acetal, polyester, nylon, MD nylon, polycarbonate, fiber, polyethylene and various NEMA grade phenolics. For additional information about Boker's washers, please visit Bokers.com. Boker's, Inc. is a Woman Owned, AS9100/ISO 9001 certified manufacturer of precision stamping, washers and spacers. To request a complimentary copy of the 2015 Washer Catalog or 2015 Stamping Brochure, contact: Boker's, Inc., 3104 Snelling Avenue, Minneapolis, MN 55406-1937; call 612-729-9365 or (TOLL-FREE) 800-927-4377 or visit Bokers.com. Download the Hi-Res version of this image. Minneapolis, MN—June 3, 2015—Boker's Inc. announces its signature sample pack and Total Service Brochure are now available. This complimentary guide details the company's qualifications along with a sampling of its comprehensive washer options. Boker's sample pack includes a variety of washer sizes and styles, including a D washer, tab washer, special shaped washer, dome shaped washer and notched washer. 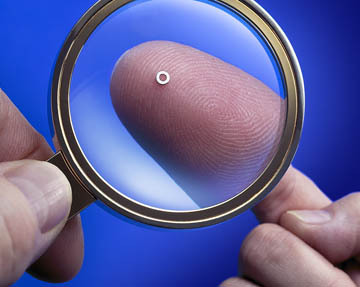 Samples include both metallic and non-metallic materials. 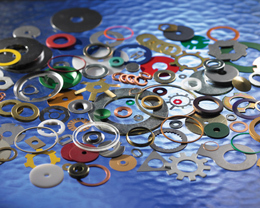 With extensive washer offerings and customization capabilities, the sample pack exhibits Boker's ability to manufacture washers that meet specific application requirements. 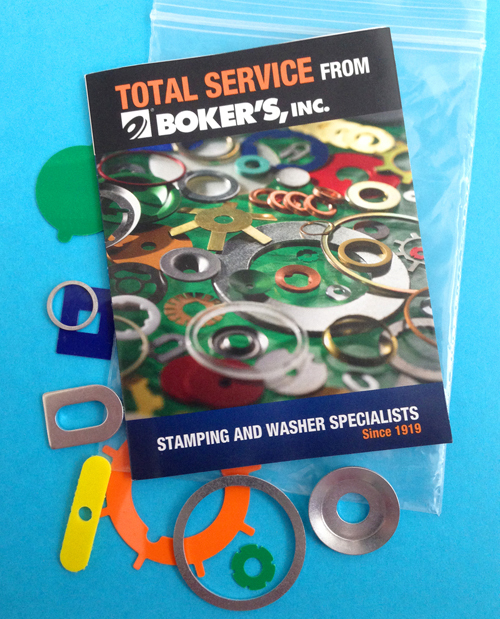 Along with the washer sampling, Boker's sample pack includes its Total Service Brochure. Detailing the company's complete range of products and services, the brochure includes Boker's stampings, secondary operations, quality assurance capabilities and certifications. It also highlights its fast turnarounds and specialty delivery programs, such as Dock-to-Stock and Just-in-Time. To satisfy diverse applications, Boker's can accommodate standard or non-standard flat washer orders in short, medium or long runs, with no tooling charges. With over 29,000 flat washer sizes, 2,000 material options, including metallic and non-metallic, and extensive custom manufacturing operations, Boker's offers millions of washer possibilities. For more information, please visit: Bokers.com. 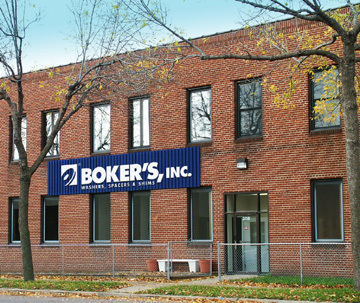 Minneapolis, MN—April 10, 2015–Over the past year, Boker's has continued to invest in manufacturing equipment, technology and process improvement for increasing effectiveness for cabinet and furniture component production. With new finishing and production equipment, and enhanced tool room capabilities, Boker's can accommodate a wide range of application specifications with fast delivery turnarounds. This expansion improves Boker's offering of made-to-order stampings and washers for cabinet, woodworking or furniture manufacturing and assembly applications. With over 95 years of experience, Boker's provides stamping solutions for all furniture categories, including hospitality, marine, healthcare, office, educational and institutional. Boker's extensive stamping capabilities can accommodate diverse assembly applications and installation requirements, such as mounts, brackets, slides, hinge plates, hardware and more. Flat blanking and piercings are available in a complete range of sizes up to 12 inches by 12 inches, metal forming in thicknesses from .005" to .190" and draws up to 3 inches deep and 8 inches in diameter. Boker's offers over 29,000 non-standard flat washer and spacer sizes without tooling charges. Washers are also available in a diverse selection of styles and shapes, including flat washers, tab washers, fender washers and chemically resistant washers. 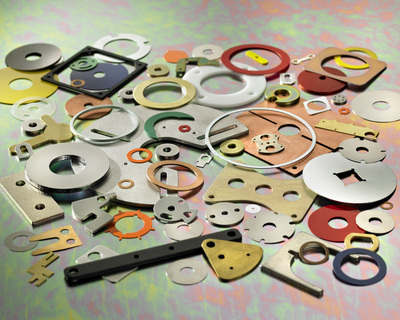 Washers and stampings are available in over 2,000 commonly specified and difficult-to-find material options. Metallic material options include low-carbon sheet steel, various spring steels, stainless steel, aluminum, brass, copper and nickel silver. Non-metallic options include ABS, acetal, polyester, nylon, MD nylon, polycarbonate, fiber, polyethylene and various NEMA grade laminates. With quick delivery turnarounds and millions of washer and stamping possibilities, Boker's delivers custom washer and stamping solutions for cabinet and furniture applications. 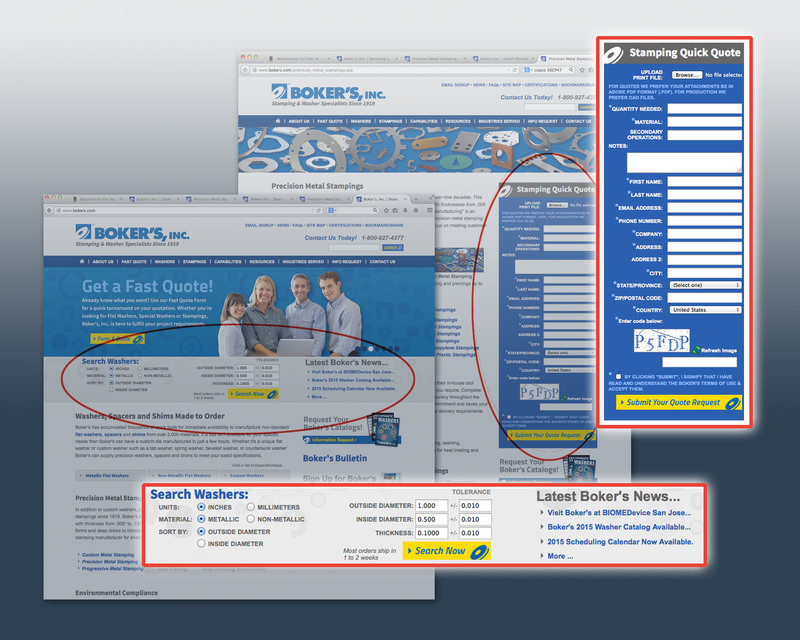 Minneapolis, MN—January 12, 2015—Boker's, Inc. announces its new website which features two interactive specification tools. Designed to enhance product specification and quote efficiency, the new tools are now available on the new Bokers.com. The Search Washer Widget allows users to identify optimal washer tools best suited for their specific application from over 29,000 available flat washer tools. With the ability to sort their search by outside diameter, inside diameter or thickness, users can obtain specific non-standard flat washer sizes instantly. The Stamping Quick Quote Widget expedites the quote process by offering an easy request for quote (RFQ) submittal. This easy-to-use form ensures that all necessary information is included upfront including: material type, secondary operations, quantities, and electronic blueprint upload to provide a fast and accurate quote. Metric conversion chart with decimal and millimeter equivalents for common measurements ranging from 1/64 to 1 inch and .1 to 100 mm. Try the Search Washer Widget and Stamping Quick Quote Widget today on the new Bokers.com. Boker's, Inc. is a Woman Owned, AS9100/ISO 9001 certified manufacturer of precision stampings and non-standard washers and spacers. Contact: Boker's, Inc., 3104 Snelling Avenue, Minneapolis, MN 55406-1937; call 612-729-9365 or (TOLL-FREE) 800-927-4377 or visit Bokers.com. 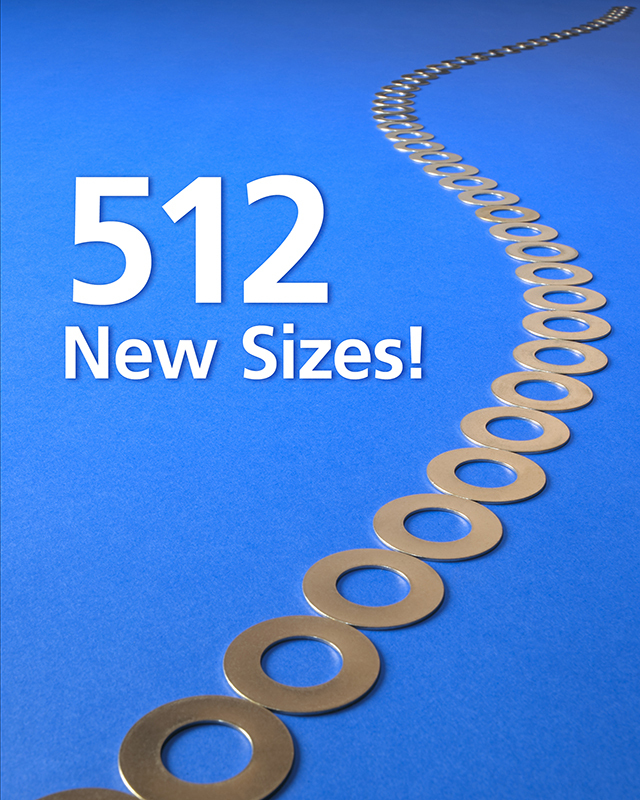 Minneapolis, MN—August 26, 2014—Boker's, Inc. has added 737 new flat washer sizes to its offering to further accommodate a large range of applications and industries. This addition significantly enhances Boker's customization capabilities, offering an expansive line of over 28,000 non-standard washer and spacer sizes. “With the addition of new sizes, Boker's has the ability to increase production and customization options, allowing us to meet the diverse application specifications of our customers,” said Andy Tscholl, Sales Manager, Boker's. Boker's non-standard precision washers are manufactured in over 2,000 commonly specified and difficult to find material options with no tooling charges. The company also provides a comprehensive range of sizes, including outside diameters from 0.080 inches to 12.00 inches with a wide range of inside diameters as well. Offering flexible production quantities, Boker's can accommodate short, medium and long runs with fast delivery turnarounds. For additional information about Boker's washers, please visit: www.bokers.com. Boker's, Inc. is a Woman Owned, AS9100/ISO 9001 certified manufacturer of precision stampings and non-standard washers and spacers. To request a complimentary copy of the company's 2014 Washer Catalog or 2014 Stamping Brochure, contact: Boker's, Inc., 3104 Snelling Avenue, Minneapolis, MN 55406-1937; call 612-729-9365 or (TOLL-FREE) 800-927-4377 or visit www.bokers.com. 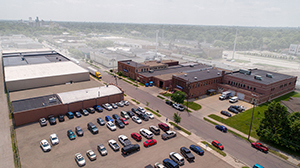 Minneapolis, MN–July 25, 2014–Boker's, Inc., has expanded their stamping and washer production capabilities to ensure quick turnaround on long runs. With high-volume production runs of over one million washers, and 95 years of experience in precision metal stamping production, Boker's can meet standard or custom design requirements while ensuring fast delivery. Boker's expansion of stamping and washer production capabilities includes the addition of high-capacity finishing equipment to increase productivity on short, medium and long runs. Boker's offers 2,000 commonly specified and hard-to-find materials such as low-carbon steel, various spring steels, stainless steel, aluminum, brass, copper and nickel silver. Boker's provides endless washer possibilities; with over 28,000 non-standard washers in sizes ranging from 0.080-inches to 12-inches outside diameter and a wide variety of inside diameter choices. Flat washers and custom shapes such as tab and notched washers can be created to meet exact design specifications. To satisfy complex, precision stamping applications, Boker's extensive stamping capabilities encompass sizes up to 12 inches x 12 inches, in thicknesses from .005" to .190" inches and draws up to 3 inches deep and 8 inches in diameter. 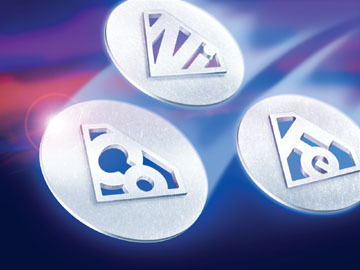 To learn more about Boker's stamping and washer capabilities, visit: www.bokers.com. Boker's, Inc. is a Woman Owned, AS9100/ISO 9001 certified manufacturer of precision stampings and non-standard washers and spacers. 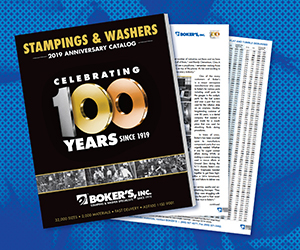 To request a complimentary copy of the company's 2014 Washer Catalog or 2014 Stamping Brochure, contact: Boker's, Inc., 3104 Snelling Avenue, Minneapolis, MN 55406-1937; call or (TOLL-FREE) or visit http://www.bokers.com/information_request.asp. Minneapolis, MN—March 20, 2014—Boker's Inc. announces its extensive manufacturing capabilities of spacers to accommodate a wide range of applications across virtually any industry. With an expansive line of spacers, Boker's offers a selection of over 28,000 non-standard spacer sizes with no tooling charges. Customized spacers are also available in a wide range of thicknesses from .005" to .190" inches, outside diameters from 0.080 inches to 12 inches and a substantial range of inside diameters. For flexible production, Boker's can also handle small, medium and long runs with fast delivery turnaround. In addition to multiple spacer sizes and shapes, Boker's offers a diverse selection of materials. Material choices include over 2,000 metallic or non-metallic options, low-carbon sheet steel, various super alloys, stainless steel, aluminum, brass, copper and nickel silver. Non-metallic materials include ABS, acetal, polyester, nylon, MD nylon, polycarbonate, fiber, polyethylene and NEMA grade laminates. Boker's, Inc. is a Woman Owned, AS9100/ISO 9001 certified manufacturer of precision stampings and non-standard washers and spacers. To request a complimentary copy of the Boker's Washer Catalog or Stamping Brochure, contact: Boker's, Inc., 3104 Snelling Avenue, Minneapolis, MN 55406-1937; call 612-729-9365 or (TOLL-FREE) 800-927-4377 or visit www.bokers.com. Minneapolis, MN—January 13, 2014—Boker's, Inc. announces that its extensive manufacturing of custom washers and stampings accommodates nearly any aerospace and aviation application. Those applications include avionics, flight control systems, airframes, engines, hydraulic, pneumatic and other aviation equipment that require specific, unique specifications. 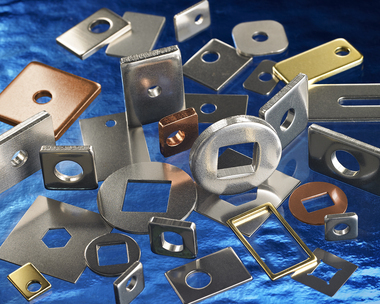 Customized stampings and washers not only meet diverse applications, but they also meet the highest quality standards in the aerospace industry. Boker's, Inc. has qualified for the SAE Aerospace Quality Standard AS9100, the highest international measure of quality and safety in the aviation, space and defense industries. Custom washers are available in outside diameters ranging from .080 inches to 12 inches. Boker's custom stamping offering includes flat blanking and piercings in sizes up to 12"x 12”, metal forming in thicknesses from .005" to .190" and draws up to 3"deep and 8"in diameter. Material choices include 2,000 metallic or non-metallic options, low-carbon sheet steel, various super alloys, stainless steel, aluminum, brass, copper and nickel silver. Non-metallic materials include ABS, acetal, polyester, nylon, MD nylon, polycarbonate, fiber, polyethylene and NEMA grade laminates. Boker's also provides over 28,000 non-standard washers and spacers that can be manufactured to suit multiple aerospace products with no tooling charges. 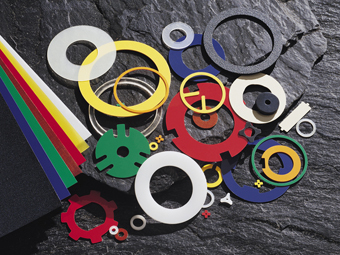 Combined with a variety of washer and spacer customization options—including size, thickness, metallic and non-metallic materials, and production levels—millions of possibilities are available. Minneapolis, MN—September 19, 2013—Boker's, Inc. announces that its extensive capabilities include extended washer sizes up to 12 inches in diameter. This is part of Boker's wide offering, which provides washers and spacers to accommodate the largest range of applications across any industry. Boker's capabilities include flat washers and custom shapes such as tab and notched washers that are created to meet your exact specifications. Sizes range from 0.080-inch to 12-inch outside diameters and substantial inside diameter choices, providing endless washer possibilities. 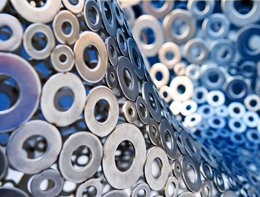 Large washers are available in numerous metallic and non-metallic materials, thicknesses and production quantities that include prototype or production runs. Metallic options include low-carbon sheet steel, various spring steels, stainless steel, aluminum, brass, copper and nickel silver. Non-metallic materials include ABS, acetal, polyester, nylon, MD nylon, polycarbonate, fiber, polyethylene and various phenolics. Washer thicknesses can range from 0.005" to .190" inches. Production can be completed with fast turnaround times for prompt shipping. Minneapolis, MN—July 22, 2013—To expand its extensive production capacity and further accommodate the largest range of applications and industries, Boker's, Inc. has added 608 new flat washer sizes to its offering. These new sizes increase the company's expansive line of 27,000 non-standard washer and spacer sizes. This addition provides the ultimate customization capability. Custom-built options include numerous metallic and non-metallic materials, sizes, thicknesses and production quantities, all of which provide millions of washer possibilities. Washers are manufactured to exact specifications in over 2,000 material options and no tooling charges, and the comprehensive size range includes outside diameters from 0.080 inches to 5.140 inches and a substantial range of inside diameters. Boker's production is also flexible, offering long, medium and short runs with fast delivery turnarounds. In addition to flat washers, other various shapes and styles are available in multiple metallic and non-metallic materials. Metallic washers include low-carbon sheet steel, various spring steels, stainless steel, aluminum, brass, copper and nickel silver. Non-metallic materials include ABS, acetal, polyester, nylon, MD nylon, polycarbonate, fiber, polyethylene and various phenolics. For additional information about washer options, visit www.bokers.com/washers.asp. Minneapolis, MN—June 26, 2013—Boker's, Inc. announces that its vast manufacturing capabilities include non-standard square and rectangular washers that can be custom made with a variety of materials and sizes to suit multiple application requirements. These non-standard square and rectangle flat washers cover a range up to 12" x 12" with thicknesses from .005" to .135". The square and rectangular washers complement diverse fastening applications. With their flat sides, square and rectangular washers are designed to prevent rotation and fit in restricted spaces that do not accommodate round washers. They are commonly used in construction, machinery, and automotive applications. Boker's manufactures square and rectangular washers to customer specifications, offering options in more than 2,000 commonly specified and difficult-to-find materials, including metallic and non-metallic materials. Metallic material selections include low-carbon sheet steel, various spring steels, stainless steel, aluminum, brass, copper and nickel silver. Non-metallic material options include ABS, acetal, polyester, nylon, nylon MD, polycarbonate, fiber, polyethylene and various NEMA grade laminates. Manufactured to order, with quick delivery turnarounds, Boker's offers endless washer possibilities to suit a wide range of application needs. For additional information on square and rectangular washers, visit /squarewashers.asp. Minneapolis, MN—August 21, 2012—Boker's announces that its extensive flat washer offering now includes 750 new sizes to accommodate the largest range of applications and industries. The addition of these new sizes increases the company's already expansive line of 26,000 non-standard washer and spacer sizes for unparalleled customization capabilities. Along with a comprehensive range of sizes, featuring outside diameters from 0.080 inches to 5.140 inches, washers are manufactured to exact specifications in over 2,000 material options and no tooling charges. To further satisfy application requirements, Boker's offers millions of washer possibilities in long, medium and short runs, with fast delivery turnarounds. In addition to flat washers, Boker's manufactures a variety of washer shapes and styles that are available in a wide range of metallic and non-metallic materials, providing a specifically engineered solution for virtually any environment and application. Metallic options include low-carbon sheet steel, various spring steels, stainless steel, aluminum, brass, copper and nickel silver. Non-metallic materials include ABS, acetal, polyester, nylon, MD nylon, polycarbonate, fiber, polyethylene and various phenolics. Minneapolis, MN—July 12, 2012—Boker's, Inc. announces its ability to custom manufacture washer and stamping solutions for virtually any appliance application. With over 90 years of experience, Boker's washers and stampings offer an ideal solution in diverse appliances, including air conditioning units, ventilation hoods, washing machines, dryers and many more—meeting appliance manufactures' exact specifications. Washers are available with outside diameters ranging from 0.080" to 12", a variety of inside diameters, a wide range of thicknesses and in over 26,000 non-standard flat washer and spacer sizes. Boker's also offers a diverse selection of styles and shapes. With options including flat washers, lock washers, fender washers and chemically resistant washers, they can easily fit a variety of appliance assemblies. Boker's extensive stamping offering includes flat blanking and piercings in a complete range of sizes up to 12" x 12", metal forming in thicknesses from .005" to .190" and draws up to 3" deep and 8" in diameter. This versatility makes Boker's stampings ideal for various appliance applications, such as guards, supports, housings, mounts, brackets and more. 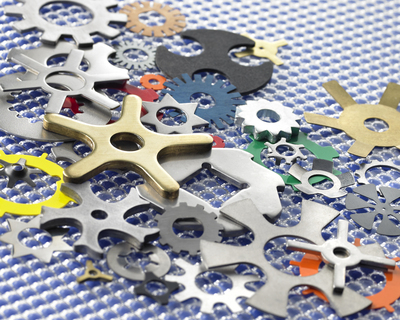 Washers and stampings are available in over 2,000 commonly specified and difficult-to-find material options. Metallic material options include low-carbon sheet steel, various spring steels, stainless steel, aluminum, brass, copper and nickel silver. Non-metallic options include ABS, acetal, polyester, nylon, MD nylon, polycarbonate, fiber, polyethylene and various NEMA grade laminates. With quick delivery turnarounds and millions of washer and stamping possibilities, Boker's delivers custom solutions for appliance applications. Minneapolis, MN—May 1, 2012—Boker's, Inc. announces its extensive offering of shims, in a variety of sizes and materials to meet diverse industry needs. Used to achieve precise spacing or fill space between mismatched components, shims are a critical component to a variety of assembly operations and applications. For ideal performance and suitability, shims can be custom manufactured to meet exact specification, with outside diameters from 0.080" to 12" and material thicknesses from 0.005" to 0.190", to accommodate virtually any application requirement, from the simplest of applications to the most complex. Boker's offers shims in the widest selection of materials—over 2,000 commonly specified and difficult-to-find materials. Metallics include low-carbon sheet steel, various spring steels, stainless steel, aluminum, brass, copper and nickel silver. Non-metallic options include ABS, acetal, polyester, nylon, nylon MD, polycarbonate, fiber, polyethylene and various NEMA grade laminates. Further, with their dedicated quality assurance and fast turnarounds, Boker's ensures shims meet strict criteria and are delivered on time. Minneapolis, MN—April 4, 2012—Boker's, Inc. announces that its expansive manufacturing capabilities include non-standard star washers in a wide variety of materials and sizes to suit virtually any application requirement. With outside diameters available from .500 inches to 6.000 inches, multiple inside diameters and a range of thickness options, star washers compliment diverse fastening applications. Star washers are a specific type of washer designed to increase locking force by resisting torque applied by the nut, preventing it from unscrewing or separating. 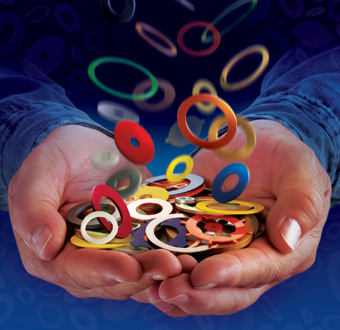 Featuring either internal or external tabs, star washers offer greater application suitability. Internal tabs run along the inside diameter, while external options have tabs located on the outer diameter for superior locking capabilities—making them ideal for applications that require continuous reliability. Boker's manufactures star washers to customer specifications, offering options in more than 2,000 commonly specified and difficult-to-find materials, including metallic and non-metallic materials. Metallic material selections include low-carbon sheet steel, various spring steels, stainless steel, aluminum, brass, copper and nickel silver. Non-metallic material options include ABS, acetal, polyester, nylon, nylon MD, polycarbonate, fiber, polyethylene and various NEMA grade laminates. Manufactured to order, with quick delivery turnarounds, Boker's offers endless washer possibilities to suit a wide range of application needs. For additional information on star washers, visit www.bokers.com/star_washers.asp. Minneapolis, MN—January 26, 2012—Boker's, Inc. announces metric washers are available in 2,000 materials. Via their easy-to-navigate website, users can browse Boker's extensive flat washer offering in either millimeters or inches for enhanced application compatibility and ordering convenience. Through Boker's online search tool, users can mandate washer criteria by selecting the appropriate unit of measurement and material, as well as designate inside/outside diameters and a thickness range. Metric washer searches can be expedited by narrowing the company's vast washer selection to sizes appropriate for specific applications. With washers available in outside diameters ranging from 2.03 mm to 130.55 mm and a variety of inside diameters and thicknesses, clients can select the ideal metric washer for virtually any application. Along with their helpful conversion chart featured on the back of their 2012 Calendar and Boker's new metric edition of the 2012 Washer Catalog, the website offers another useful, yet simple, avenue for clients to order metric washers. Manufactured in over 26,000 non-standard flat washer and spacer sizes and with over 2,000 commonly specified and difficult-to-find material options, Boker's provides metric washers to clients' exact specifications. Metallic material options include low-carbon sheet steel, various spring steels, stainless steel, aluminum, brass, copper and nickel silver. Non-metallic options include ABS, acetal, polyester, nylon, MD nylon, polycarbonate, fiber, polyethylene and various NEMA grade laminates. With quick turnarounds and millions of washer possibilities, Boker's offers washer solutions to suit a wide range of applications. Minneapolis, MN—September 7, 2011—Boker's, Inc announces their comprehensive washer offering includes standard washers in multiple sizes and materials, providing ideal solutions for versatile fastener industry applications. With the company's extensive manufacturing capabilities and increased washer capacity, Boker's offers standard flat washers in short, medium and long runs, with outside diameters ranging from 0.081 inches to 5.000 inches, plus numerous inside diameter and thickness options. Offering custom modifications to meet individual application needs, Boker's broad washer collection includes a wide range of options, such as standard wrought washers, U.S.S. flat washers, S.A.E. flat washers, fender washers, machine screw washers, A.N.S.I. metric plain washers and A.N.S.I. B18.22.1 American standard type A and type B washers. Boker's standard washers are flat, tumbled, deburred and can be heat-treated or plated for your specifications. 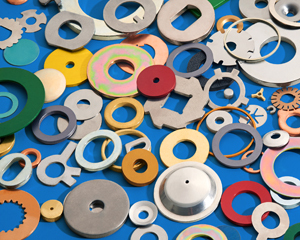 Standard washers are available in over 2,000 commonly specified and difficult-to-find materials with numerous approved vendors for heat treating and plating. Metallic material options include, but not limited to, low-carbon sheet steel, various spring steels, stainless steel, aluminum, brass, copper and nickel silver. Non-metallic material options include ABS, acetal, polyester, nylon, nylon MD, polycarbonate, fiber, polyethylene and various NEMA grade laminates. With over 25,000 stock tools, fast turnarounds and infinite washer possibilities, Boker's manufactures cost-effective, customized solutions for virtually any application. Boker's, Inc. is a Woman Owned, AS9100/ISO 9001 certified manufacturer of precision stampings and non-standard washers and spacers. To request a complimentary copy of the company's Washer Catalog or Stamping Brochure, contact: Boker's, Inc., 3104 Snelling Avenue, Minneapolis, MN 55406-1937; call 612-729-9365 or (TOLL-FREE) 800-927-4377 or visit www.bokers.com. Minneapolis, MN—May 17, 2011—Boker's, Inc. announces that tab washers, offered in a wide variety of sizes and materials, are now available as part of their washer manufacturing capability. Tab washer sizes include outside diameters ranging from .080 inches to 6.000 inches, in addition to multiple inside diameter and thickness options, allowing tab washer compatibility with all types of nuts, bolts and other fastening systems. Boker's manufactures numerous configurations of tab washers including: internal tab, external tab, internal/external tab, multiple internal/external tab, and locking tab washers. Tab washers are a type of lock washer, round in shape and often manufactured with a single tab or multiple tabs that can be formed to shape around bolts/nuts or designed to lay flat. Ideal for use in harsh environments, tab washers effectively lock a part into place in applications requiring extreme heat conditions or heavy vibrations. Boker's custom manufactures tab washers to customer specifications, offering tab washers in 2,000 commonly specified and difficult-to-find materials, including metallic and non-metallic materials. Metallic material options include low-carbon sheet steel, various spring steels, stainless steel, aluminum, brass, copper and nickel silver. Non-metallic material options include ABS, acetal, polyester, nylon, nylon MD, polycarbonate, fiber, polyethylene and various NEMA grade laminates. With quick turnarounds and millions of washer possibilities, Boker's offers washer solutions to suit a wide range of application needs. Minneapolis, MN—April 14, 2011—Boker's, Inc. announces washers and spacers made from a variety of chemically resistant materials. Many harsh environments require washers to withstand a variety of chemicals and abrasive, corrosive, high purity, or viscous fluids. Depending on the specific chemical, temperature and application, a variety of materials may be suitable. Boker's chemically resistant products provide manufacturers with quick access to washers and spacers fit for their specific applications. 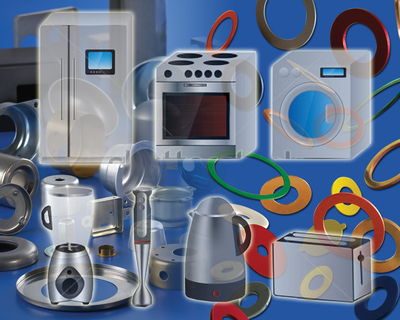 Popular chemically resistant washer materials include ABS, polyethylene, polypropylene, PTFE and PVC, PVDF. 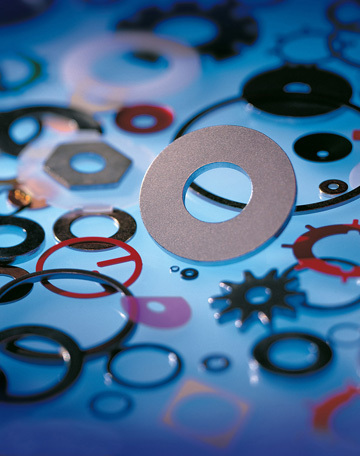 Boker's chemically resistant washers and spacers are used in a variety of industries such as and not limited to agriculture, semiconductor, medical, pharmaceutical, food & beverage, automotive and aerospace. Chemically resistant washers are shipped with REACH compliance documentation when requested. REACH is the European Community Regulation involving the registration, evaluation, authorization and restriction of chemical substances. Most chemically resistant washers are REACH compliant, depending upon the specific material specification. In addition to chemically resistant materials—and over 2,000 total material variations—Boker's provides endless washer and spacer possibilities with 25,000 non-standard flat washer and spacer sizes available without tooling charges. Outside diameters range from 0.08" to 5.140", and washers and spacers are available in a broad variety of inside diameters and thicknesses. Minneapolis, MN—August 24, 2010— Boker's, Inc. announces that the company's extensive washer selection includes fender washers, available in a wide variety of sizes and materials. Fender washers are offered with outside diameters ranging from 0.081 inches to 5.000 inches, plus numerous inside diameter and thickness options. With ready access to more than 2,000 commonly specified and difficult-to-find materials, Boker's delivers fender washers in materials including low-carbon sheet steel, various spring steels, stainless steel, aluminum, brass, copper and nickel silver. Non-metallic material options include ABS, acetal, polyester, nylon, nylon MD, polycarbonate, fiber, polyethylene and various NEMA grade laminates. These fender washer sizes are easily accessible by searching for specific outside or inside diameters at bokers.com/fender_washers.asp. A fender washer, though similar in shape to a standard washer, differs in that the outside diameter is traditionally much larger in proportion to the center hole. With this design, a fender washer can be placed under the head of a bolt or nut to help distribute forces applied when tightening. Its oversized outside diameter also provides more bearing surface for the load of the fastener—distributing the load further on soft or thin materials. 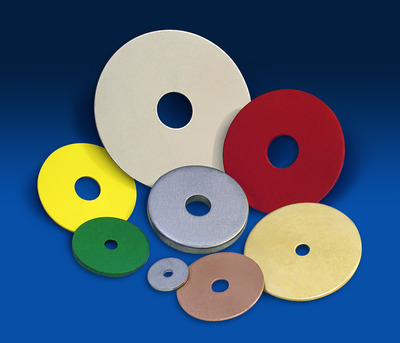 Fender washers are commonly used in automotive, sheet metal, plumbing and electrical applications. Boker's complete offering of fender washers includes a selection of over 8,968 sizes and 2,000 metallic and non-metallic materials—all offered with no tooling charges. With quick turnarounds and millions of washer possibilities, Boker's offers washer solutions to suit the widest range of application needs. Minneapolis, MN—June 30, 2010—Boker's, Inc. announces that the company's non-standard flat washers are available in a variety of non-metallic materials and over 5,000 sizes—all offered with no tooling charges. These sizes include miniature washers with outside diameters of 0.080 inches and range up to outside diameters of 5.000 inches. A broad selection of inside diameters and thicknesses are also available, and Boker's can produce washers in custom sizes to meet exact specifications. Boker's has ready access to a diverse variety of non-metallic materials, such as ABS, acetal, PVC, polyester, nylon, nylon MD, polycarbonate, fiber, polyolefins, polimide films, and various NEMA grade laminates. Supplier material certifications or certificates of compliance are provided for these materials upon request. Quick turnaround on small, medium and large washer orders is possible due to Boker's “Just-in-Time"and “Dock-to-Stock"programs. The company's 2010 Washer Catalog and website, www.bokers.com, provide easy access to a full listing of tools available for non-metallic washer requests. These resources also outline Boker's complete offering of washers and spacers, which includes a selection of 25,000 sizes and 2,000 metallic and non-metallic materials. Minneapolis, MN—February 22, 2010—Boker's, Inc. announces they have added a new 150-ton press that enhances the company's comprehensive metal stamping capabilities. The stamping press performs progressive tooling, accomplishing multiple operations—including stamping, blanking, piercing and forming—at once, decreasing secondary operations and lead times. Along with improving productivity through progressive tooling, the press offers increased capacity for long production runs. It features a 12-inch feeder and is capable of 200 strokes per minute—easily fulfilling complex, high volume stamping orders for the automotive, electronics, aerospace and medical markets. Boker's precision stampings are manufactured in a wide variety of sizes, including flat blanking and piercings up to 12" x 12", thicknesses from .005" to .190", and draws of up to 3" deep and 8" in diameter. With over 90 years of experience, Boker's provides superior metal stampings selected from more than 2,000 materials available. The company's world-class manufacturing goals—such as complete Statistical Process Control (S.P.C.) capability, in-house and wire EDM tooling, “Just-In-Time"and “Dock-To-Stock"programs, and ISO 9001 certified status—ensure the highest level of quality in all metal stampings produced. Minneapolis, MN—August 31, 2009—Boker's, Inc., announces 665 new washer sizes are now available. The new sizes join the company's line of 23,000 non-standard washer and spacer sizes to effectively provide endless solutions for a broad range of application requirements. Washers are available without tooling charges in short, medium or long runs. With more than 90 years of industry experience, Boker's provides miniature washer sizes with outside diameters as small as 0.080". For applications requiring larger sizes, possibilities are available with ODs up to 12". Washers are offered in a choice of more than 2,000 commonly specified and hard-to-find materials, including low carbon sheet steel, five types of spring steel, stainless steel, aluminum, brass, copper and nickel silver. Non-metallics—such as ABS, acetal, polyester, nylon, PTFE, polycarbonate, fiber, polyethylene, and various phenolics—are also available. Customers can obtain the exact washers or spacers they need in five days or less. For an immediate quote visit www.bokers.com. Boker's offers washers with outside diameters ranging from 0.080 to 5.140 inches and a wide variety of inside diameters and thicknesses. Along with the 5,000 sizes, custom sizes can be made to exact specifications. A complete listing of the tools available for non-metallic requests, as well as additional materials, can be easily referenced via Boker's simple-to-use washer catalog and website. Minneapolis, MN—September 9, 2008—Boker's, a manufacturer of washers and stampings with 90 years of experience, has added 800 sizes to their expansive product offering. 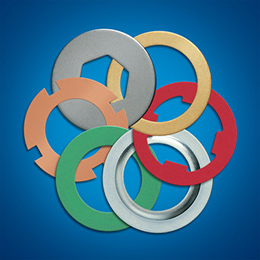 With this addition, non-standard washers and spacers are now available without tooling charge in more than 22,800 sizes and offered in a choice of more than 2,000 commonly specified and hard-to-find materials, including low carbon sheet steel, five types of spring steel, stainless steel, aluminum, brass, copper and nickel silver, as well as non-metallics including nylon. This broad variety of sizes encompasses miniature washers—as small as 0.080" in outside diameter—to large washers with ODs up to 5.140". Customers can simply select a size and specify a material and quantity at www.bokers.com. 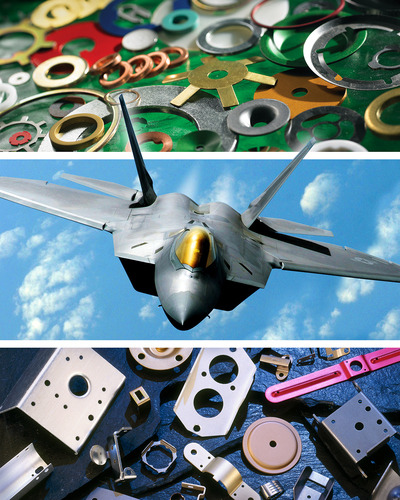 A wide range of metallic and non-metallic materials, paired with quality manufacturing and fast delivery ensures Boker's meets the most challenging application requirements in aerospace, medical, automotive, HVAC and many additional industries. Minneapolis, MN—February 18, 2008—Boker's, Inc. announces the addition of a new manufacturing and training facility, located on the company's Minneapolis headquarters campus. This expansion, which is currently undergoing infrastructure upgrades, will add 23,000 square feet to the company's current 70,000-square-foot facility. Boker's, a manufacturer of quality stampings, washers and spacers, continues to expand manufacturing capacity and advance technology expertise to meet the demands of their diverse clientele. The new building will provide additional office space, company training areas, increased manufacturing, and product storage capacity. 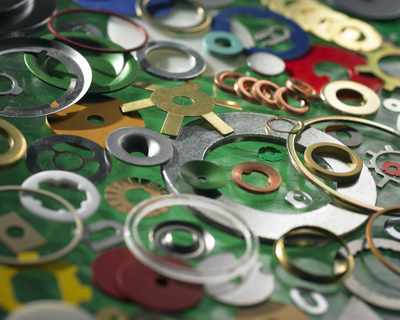 With 89 years of experience in the industry, Boker's offers a wide selection of washers, spacers and stampings. With over 22,000 washer sizes, a wide range of thicknesses, numerous outside and inside diameters, and over 2,000 materials available, Boker's delivers millions of washer possibilities with no tooling charges. This new facility will expand these capabilities by housing new capital purchases of the latest stamping technology and manufacturing concepts—allowing further growth of the company's already-expansive product line. BOKER'S NOW OFFERS MINIATURE WASHERS FOR INTRICATE APPLICATIONS, OF 0.080" OD OR SMALLER. Minneapolis, MN—January 22, 2007—Boker's, Inc. announces that it now offers the production of miniature washers to its availability of custom-specified products. 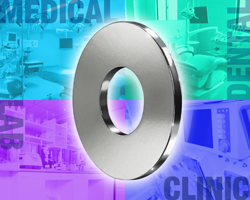 Boker's miniature washers may be specified smaller than 0.080" in outside diameter and 0.030" in inside diameter, with material thickness of 0.005" and less -- making them ideal for the medical design and aircraft industries, or any application involving small parts. Choose from over 2,000 commonly specified and hard-to-find materials such as low carbon sheet steel, five types of spring steel, stainless steel, aluminum, brass, copper, nickel silver, titanium and Monel®, and non-metallic materials such as nylon. 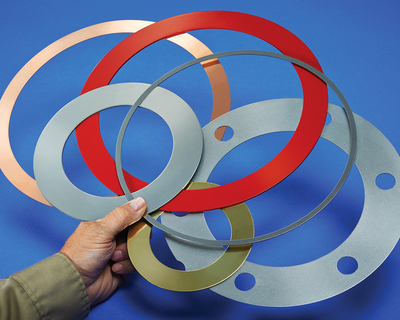 Boker's washers are flat and tumble de-burred and available with heat-treated or plated surfaces. Boker's can make products to exact specifications, delivered quickly to meet customer stocking requirements. BOKER'S NOW OFFERS SUPERALLOYS AMONG OVER 2,000 MATERIAL CHOICES FOR WASHERS AND STAMPINGS. Minneapolis, MN—May 17, 2005—Boker's, Inc. announces the addition of wrought cobalt,iron and nickel-base superalloys to the company's industry-best selection of over 2,000 washer, spacer and stamping materials. Boker's features the capabilities to produce short, medium or large run washer and spacer orders in over 19,000 non-standard washer sizes with no tooling charges. The new materials include varieties of Hastelloy, Inconel, Haynes, and Elgiloy™. Washers and spacers from Boker's can be manufactured with outside diameters ranging from 0.080" to 5.140”, plus a full range of metric sizes and large diameter washers. Combined with a variety of inside diameters, thicknesses and materials, Boker's offers millions of possibilities.